Bluedoor Publishing, 2010-10-01. Paperback. Used:Good. Bluedoor Publishing. PAPERBACK. 0968288308 Like New Condition. . Fine. Bluedoor Publishing. PAPERBACK. 0968288308 New Condition. . New. Bluedoor Publishing, 2010-10-01. Paperback. Good. Surrey, B.C. : Hancock House Pub Ltd, 1995. Second Printing . Paperback. Near Fine/No Jacket. 8vo - over 7¾" - 9¾" tall. SIGNED, INSCRIBED AND DATED BY AUTHOR, Near Fine red color pictorial trade paperback. Previous owner name label on endpaper and tan shadow. (1995), 8vo, , 6-287pp. , "The legendary million-acre ranch in central British Columbia is still worth more than $10 million today,...This book makes a galloping good read, from the notorious founders, the Harper Gang of West Virginia in the 1800s, through the days of the California and Cariboo Gold rushes..."
Surrey, B.C. : Hancock House Pub Ltd, 1994. Book. Very Good. Trade Paperback. Signed by Author(s). Canadian First. Inscribed and dated Nov. 24/94 by Judy Alsager on the title page: "In appreciation, All my best, Judy Alsager;" minor edge wear; otherwise a solid, clean copy in collectable condition; color and black and white photograph section bound into the centre of the book..
Bluedoor Publishing, 2010. Trade Paperback. Good. Softcover. Sound & good copy, light to moderate rubbing/edgewear to wraps, gift notation within. First Revised Edition-Tight, clean and unmarked-Signed by Author-Numerous color photo's " British Columbia' s sprawling and legendary million-acre cattle empire--at long last came under Canadian ownership in 1978. Judy Alsager, one of the owners, takes us on a sincere and moving journey of breathtaking scenic images through the tumultuous times that see the Ranch rise proudly from its previous comatose state to become a thriving, exciting operation once again. She shares with us the heartache and desperation of the Alsager family as a bizarre series of events brings the Gang Ranch toppling down without warning, thrusting the family into an alien labyrinth of legal and banking malfunctions. This is an honest account of what actually transpired to tear the Alsager family apart and how the Gang Ranch was wrested away from the family's grasp, resulting in the tragic loss of one of Canada's grandest and most historic assets. " U.S.A.: Hancock House Pub Ltd, 1994. Soft cover. Good. 8vo - over 7¾ - 9¾" tall. Owners stamp and shows some wear. Colour Photographs (illustrator). In 1978, the famous (and HUGE) Gang Ranch near Williams Lake, British Columbia was taken over for the first time in its 100 year history, by a Canadian owner - Alsager Holdings. THESE 288 pages recount the ten year roller-coaster ride of this family/business operation. Was the ranch a BIG operation ? At one time it had a new calf crop of 2,385 head. Meet Old Jimmy Rosette, Oren Alsager, Phil Gisler, Cowboss Lonnie Jones, Bull 107, Karen Stoughton, Warren Farrell, Thaddeus Harper, Tall Timber, and Pearl St. Jacques - among dozens of others. Section of mostly colour photos and center. Two pages of MAPs right after title page. U.S.A.: Bluedoor Publishing, 2010. Soft cover. Very Good. 8vo - over 7¾ - 9¾" tall. The Gang Ranch--British Columbias sprawling and legendary million-acre cattle empire--at long last came under Canadian ownership in 1978. Judy Alsager, one of the owners, takes us on a sincere and moving journey of breathtaking scenic images through the tumultuous times that see the Ranch rise proudly from its previous comatose state to become a thriving, exciting operation once again. She shares with us the heartache and desperation of the Alsager family as a bizarre series of events brings the Gang Ranch toppling down without warning, thrusting the family into an alien labyrinth of legal and banking malfunctions. 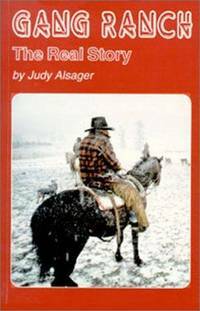 This is an honest account of what actually transpired to tear the Alsager family apart and how the Gang Ranch was wrested away from the familys grasp, resulting in the tragic loss of one of Canadas grandest and most historic assets. Bluedoor Publishing. Paperback. 0968288308 . Fair. 2010. Hancock House Pub Ltd. Paperback. 0888392753 Has some light general reading/shelfwear, with tanning to page edges - otherwise, this is a clean, tight copy. Dispatch within 24hrs from the UK. . Good. 1994. Bluedoor Publishing, 2010. Book. Very Good. Soft cover. trade paperback, light fore edge lift to covers. signed, In Appreciation, by Judy Alsager. Hancock House Pub Ltd, 1994. Book. Very Good. Soft cover. Inscribed & Signed By Author. trade paperback. Hancock House Pub Ltd, 1994-01. Paperback. Good. Surrey, BC: Hancock House, 1996. Reprint. paperback. Good. 8vo. 287pp. Col.plates,mnaps,. Some plates loose and refastened with selotape. Hancock House Pub Ltd. Used - Good. Ships from Reno, NV. Shows some signs of wear, and may have some markings on the inside. 100% Money Back Guarantee. Shipped to over one million happy customers. Your purchase benefits world literacy! Hancock House Pub Ltd. Paperback. GOOD. Spine creases, wear to binding and pages from reading. May contain limited notes, underlining or highlighting that does affect the text. Possible ex library copy, thatâll have the markings and stickers associated from the library. Accessories such as CD, codes, toys, may not be included. Hancock House Publishers, 1994. Paperback. Good. Disclaimer:A copy that has been read, but remains in clean condition. All pages are intact, and the cover is intact. The spine may show signs of wear. Pages can include limited notes and highlighting, and the copy can include previous owner inscriptions. At ThriftBooks, our motto is: Read More, Spend Less.Dust jacket quality is not guaranteed.